Pin oak is a moderately large tree with normal heights ranging from 70 to 90 feet with diameters between 2 and 3 feet. The bark of this tree is smooth, reddish to grayish-brown during the juvenile period, becoming darker and shallowly fissured as the tree growth slows with age. The lower branches of pin oak are prostrate to descending, with smooth, slender, reddish-brown twigs. Clusters of pointed buds are located at the tips of twigs. Three to five inch alternate leaves have 5 to 7 points or lobes with bristled tips and deep C-shaped sinuses. The leaves change in color from a dark green to a deep scarlet red in fall. The leaves are deciduous but will usually persist on the tree into winter. The flowers of pin oak emerge soon after new leaves unfold in spring (April to mid-May). The acorns that develop are roundish, short stalked, 3/8 to 1/2 inches long, and capped with a thin and shallow saucer-like cup. The acorns will take 16 to 18 months to develop from pollination to maturity. When mature the acorn turns light brown to reddish-brown and will drop from September to November. Pin oak is utilized by many game species, especially wood ducks, white-tail deer, and wild turkey. 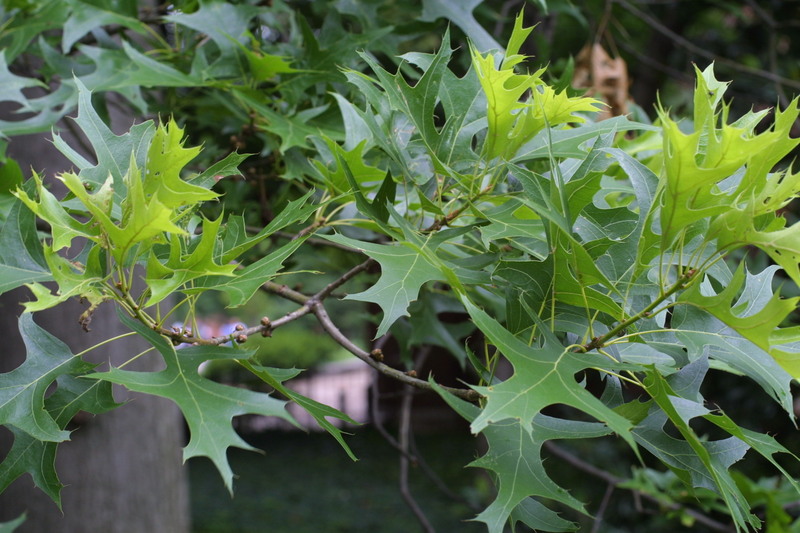 Due to its use by these highly sought after animals, pin oak is commonly planted for food plots. Pin oak is often confused with scarlet oak (Q. coccinea) due to similar appearance. Scarlet oak is an upland species that prefers soils with good drainage on dry sites. In 30 to 35-year-old stands of pin oak, 4,000 to 20,000 sound acorns per acre yields have been documented!